When your bouquet arrives with you or the recipient, be sure to take a photo of the flowers at their best. Upload your photo to Facebook or Instagram. Remember to tag @AppleyardLondon with hashtag #appleyardluxuryflowers When you have completed these steps, we will contact you through a direct message. Please read our T's & C's. Once verified, you will receive an email with your £15 gift voucher code to spend at appleyardflowers.com. 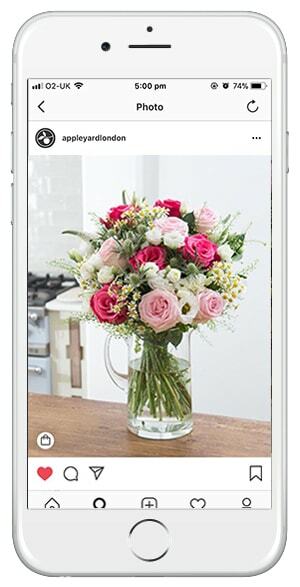 Take a picture showing off your new bouquet in full display. Follow our handy flower care tips on how to arrange your flowers to look their best. Don't forget to read through the terms and conditions before you proceed. When you have taken the perfect shot, upload your photo to Facebook and/or Instagram. Please make sure you tag us in your photo with @AppleyardLondon, and mention the hashtag #appleyardluxuryflowers. Don't forget, you can take a screenshot of your shared picture to show us later. Once you have shared your photo with the hashtag and have tagged us in the image, we will contact you. Our Social Media team will contact you via a direct message, so please keep checking these to see if we have got in touch. We will need your email address in order to send a gift voucher to you worth £15. If you still need some help, search for 'moments' in our help centre to find the answers to some of your most common questions.